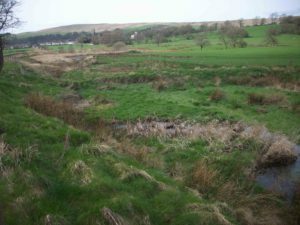 On a dry and calm Saturday, with hazy sun, the Pendle Archaeology Group decided to revisit Heyhouses in the ‘Hidden’ or Sabden Valley. The morning was spent exploring the old settlement and talking about its historical and agricultural background from the 14C to the late 18C. This involved examining old photos of cottages, comparing old maps with modern ones and discussing what had disappeared. 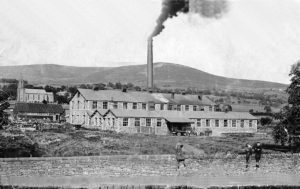 At the end of the 18C came the Calico Printworks and the impact of the Industrial Revolution on Sabden was immediate. Textile printers poured into the hamlet in increasing numbers from Padiham, Accrington, Rossendale and from as far afield as Preston. The demand for housing led to Top, Step, Bury, Crow Trees, Centre and Long Rows. The first church to be built was the Baptist Church in 1797. Baptism was not by fire, but by a refreshing immersion in the mill lodge on Badger Wells Water. These printworks consumed vast quantities of clean water and soon Badger Wells Water could not supply all that was required. New lodges were built up the Sabden Brook valley between Sabden and Dean Farm. After lunch, the group played detective. Using a blank 1844 map, they mapped the many lodges and water channels, so as to understand the complexities of one aspect of the calico printing process. We also listened to a surprising impromptu rendering of poignant poetry by William Neary and heard the cry of the curlews too.